Hip to Hip Theatre Company is dedicated to stimulating and developing interest in the theatre arts in underserved communities by providing free, family-friendly, professional productions of popular classics, and free theatre workshops for children, in public spaces. Theatre is a celebration of community spirit. Great plays and performances have the power to change lives. Theatre should be accessible to the widest possible audience. Hip to Hip Theatre Company was founded in 2007 by Queens-based actors Jason and Joy Marr, who wanted to share with the community their enthusiasm for great plays, the works of Shakespeare in particular. What started as “putting on a play" in the neighborhood, has grown into a multi-borough program of “Free Shakespeare in the Park." 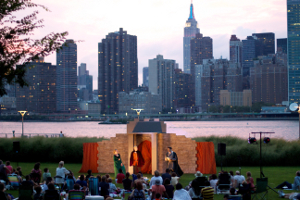 Two fully produced Shakespeare plays tour in repertory to eleven diverse park settings throughout Queens, the Bronx, Jersey City and Southampton, drawing an audience of over 7,000. The popularity of this free programming has made Hip to Hip Theatre Company the de facto public theatre of Queens. Why “Hip to Hip”? Two reasons: one, the phrase “hip to hip” is lifted right out of Shakespeare’s Comedy of Errors and shows our commitment to the plays of Shakespeare; and two, the phrase captures the uniquely collaborative nature of the theatre arts, where a group of artists must stand “hip to hip” to create a unified production. Hip to Hip’s first order of business in August 2007 was to lay the groundwork for an annual summer program of “Free Shakespeare in the Park” in Queens. Hip to Hip presented Shakespeare’s As You Like It at two outdoor venues: the open-air stage of Woodside’s Windmuller Park and the beautiful courtyard of Sunnyside’s All Saint’s Church. The performances drew an audience of approximately 500. In 2008, Hip to Hip presented Shakespeare’s Twelfth Night. Thanks to the success of the prior season, Hip to Hip was able to increase the number of performances and the number of venues, adding Southampton’s Agawam Park to the tour. The performances drew an audience of approximately 950. In 2009, Hip to Hip was for the first time awarded public funding from New York City’s Department of Cultural Affairs and the New York State Council on the Arts, administered by Queens Council on the Arts. With a budget twice the size as the prior year, Hip to Hip was able to expand both the size and scope of its programming. 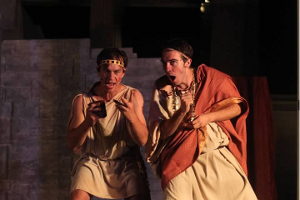 For the first time, Hip to Hip presented two productions (A Midsummer Night’s Dream and Romeo & Juliet) in seven geographically and demographically diverse communities, and drew an audience of approximately 2,000. 2010 was an extraordinary year of growth for Hip to Hip. In addition to receiving increased public funding, it received a generous sponsorship geared toward the technical elements of production. This, coupled with the prior seasons’ success, raised the profile of Hip to Hip and attracted the attention of the New York Times, National Public Radio and countless Queens-based periodicals. Hip to Hip’s productions of Taming of the Shrew and Macbeth reached nearly 4,000 people at eight diverse park settings over the course of a three-week tour. In spite of the poor national economic environment in 2011, Hip to Hip was able to maintain its programming with a slightly smaller budget. Its productions of Othello and Much Ado About Nothing were lauded by the critics and played to approximately 4,400 people at nine venues. In a New York Times article, Hip to Hip was mentioned as proudly carrying the mantle of the legendary Joseph Papp by providing free Shakespeare in the park in New York City’s underserved boroughs. 2012 was a major growth year. Hip to Hip increased the reach of its programming by adding five new venues to its tour of Free Shakespeare in the Park, it enhanced the quality of its productions by purchasing a wireless microphone system for easy audibility, it solicited and won greater involvement from the community and the City of New York, and it launched several outreach initiatives, including “Kids and the Classics,” a program designed to introduce children to classic literature and performance. Hamlet and Comedy of Errors toured to twelve diverse venues, playing to an audience of approximately 5,100. 2014 was Hip to Hip’s most polished season to date. After several years of major expansion, Hip to Hip decided that 2014 would be a year to grow into its bigger clothes. The first order of business was an across-the-board evaluation of all components of its programming, with an eye toward maximizing efficiency, including vetting the creative team, mastering its technical set-up, devising smarter outreach strategies, making more meaningful contact with already loyal patrons, and creating a more vibrant relationship with the broader NYC theatre scene. Cymbeline and The Two Gentlemen of Verona toured in repertory together with a redeveloped version of “Kids & the Classics” to 12 diverse parks, playing to an audience of 7,106. In 2015, Hip to Hip increased the quality and the quantity of its programming, and it raised its profile by creating a stronger connection to the broader New York City theatre scene. A robust creative team, consisting of 36 theatre artists, including Broadway actors, a razor-sharp dramaturg, and an international guest director, created vibrant, thought-provoking productions of The Merchant of Venice and The Merry Wives of Windsor. 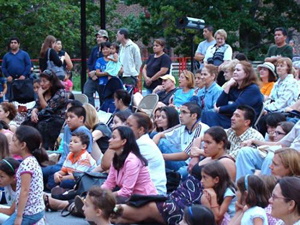 In addition to drawing larger audiences to its venues in Queens, Southampton and Jersey City, Hip to Hip expanded its footprint to include 2 new venues: the Bronx (the most underserved of NYC’s five boroughs) and Manhattan (where its production of Merchant was featured in the New York International Fringe Festival, the largest multi-arts festival in North America). In total, its 6-week tour reached 7,931 people. In addition, Hip to Hip further developed its children’s program “Kids & the Classics” by making it highly interactive, and 853 enthusiastic children ages 4 – 14 participated in it.